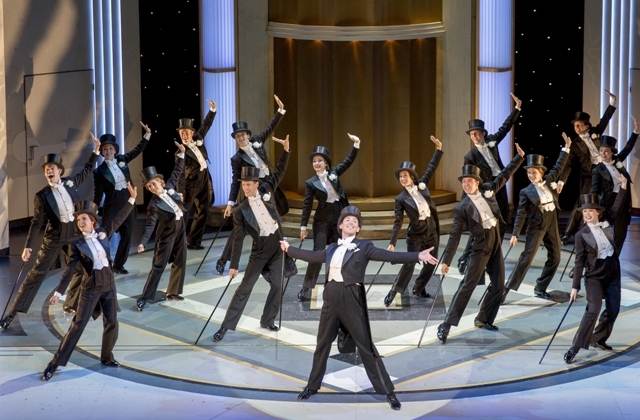 When it comes to the grand old song and dance musicals, Top Hat is the epitomy of glamour, decadence and charm. Fred Astaire and Ginger Rogers helped lift the movie to iconic status, as did the tremendous soundtrack by Irving Berlin with hits including Let's Face The Music and Dance, Cheek To Cheek and Puttin' On The Ritz. Now audiences across the country have the chance to experience the glamorous production during a UK tour that takes in Birmingham, Southampton and Bromley, along with dates in Dublin, Ireland. I caught the show during its latest tour at Birmingham Hippodrome. Performed by a cast of 29 and accompanied by 11 live musicians, Top Hat is a multi award-winning musical comedy that clearly has style. The lavish sets and costumes simply drip in decadence and the big show dance numbers are fabulously grand, but it is ultimately the scintillating dances between the pair of talented leads that steal the limelight. 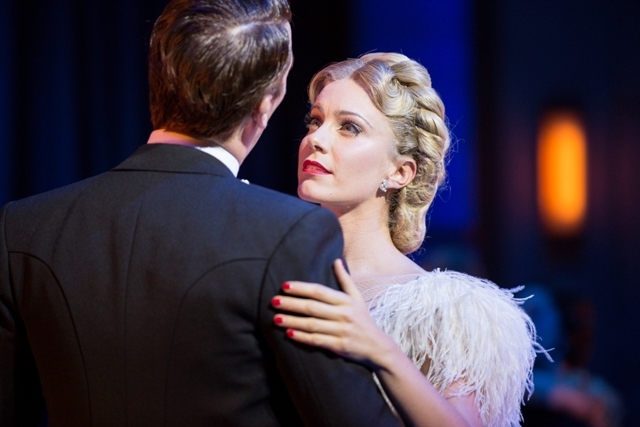 Romantic scenes between the lead characters are a delight in Top Hat. Taking us back to a time in the 1930s when romantic tales were fluffy and innocent and screwball comedy was all the rage, it's a sprightly adventure into misunderstandings, mistaken identities and the ethos that despite it all, let's face the music and dance. The story revolves around Jerry Travers, a dancing sensation who ends up tapping his his way across Europe to win the heart of society girl Dale Tremont, who wrongly thinks he is married to one of her good friends. 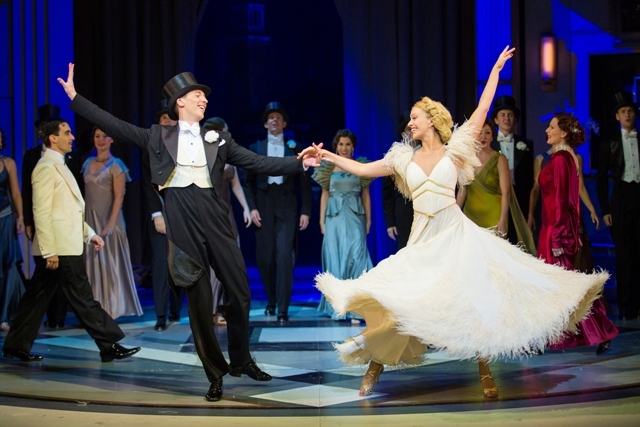 In the lead roles are Alan Burkitt and Charlotte Gooch, whose dancing, in particular, is sensational. Add to that a frisson of chemistry and they make for an exciting pairing. Their dance routines together have an almost dreamlike, gentle quality. Burkitt effortlessly makes tap dancing look easy and is over-flowing with ease and charm that sets hearts a flutter, while Gooch matches him step for step on the dancefloor and has the same sparkiness that made Ginger Rogers so likeable. The West End show, starring former Strictly Come Dancing winner Tom Chambers, won a trio of accolades in the 2013 Olivier Awards including Best New Musical, Best Choreographer and Best Costume Design and it's clear to see why. There are over 200 impeccable costumes in the show, which will make every woman want to rush out and buy a whole new vintage wardrobe. 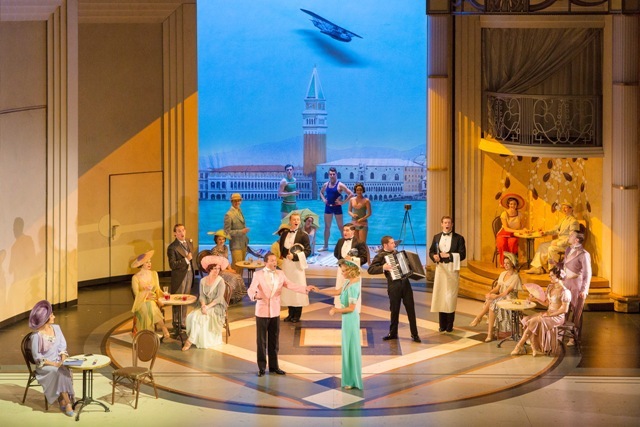 Meanwhile, the dazzling sets bring to life the Art Deco chic of the era from a New York club to pre-war London and a beautifully sophisticated Venice. It's also refreshing to see that there is more to the production than just the soundtrack and dance routines. The fun storyline has substance and plenty of comedy from a group of endearing characters, none more so than the silly but hard-done-by Italian fashion designer Alberto Beddini (an enthusiastic Sebastien Torkia) and honourable butler Bates (a terrific John Conroy). From start to finish, the whole production has a sheen of sheer decadence and joy. It's romance with a capital R.
Tickets cost from £19. For more information, checkout the Top Hat Tour website or individual theatres.